Social media has become a massive part of our culture. In fact, it has changed our culture. It's changed the way we do business, how we talk to each other and how we entertain ourselves. It's also changed how music fans experience music and how they experience the artists behind the music. So if you are an artist promoting your music on the Internet and you're not already plugged into a social media outlet or two, it's time to jump in. If you're not connected, you are quickly becoming disconnected with what's going on around you, socially speaking. The explosive popularity of social media tools like Facebook and Twitter demand that you, as an artist, become more immediately accessible to your fans. It's not enough to have a web site or even a MySpace page anymore. Your fans want to know you, they want to follow you and they want to interact with you. They want to chat with you personally, comment on your music and see what you're doing right now. Your fans expect you to be part of their daily "friend-checking" routine. Your life is interesting to them. Your life is entertainment to them. Your life is a reality show and you didn't even know it! If you ask me, it's all getting just a bit creepy. On one hand, the level of personal interaction social media encourages is a good thing. When it comes to Internet marketing, developing relationships with your fans is a key element. It always has been. But now, as you get more involved with social media and start posting your "status update" several times a day for the world to see, things begin to get personal, perhaps a little bit too personal. How do you cope with this? Having been active in the social media world for a while now, I've discovered the importance of setting boundaries for what I do and do not post for the world at large to read. I have learned that if you cross these boundaries, there can be social consequences. Have you ever really thought about how the words you post come across to your fan base? What you post can drastically change your reader's opinion about you, in both good and bad ways. While a fan might be thrilled to find you on Twitter or Facebook at first, after following your posts for a while they may actually become bored with you, disappointed in you, turned off by you or even angry at you. Social interaction with your fans is a good thing... to a point. But it would be wise to give yourself a few rules to go by; rules to help protect you not only from yourself (you can be your own worst enemy), but also those who follow you that may or may not have your best interests in mind. 2) Be Wary of Discussing Politics, Religion and Controversial Subjects. That is, unless those very things define who you are as an artist. If your music is political by nature, you can be political in your commentary. If your music is not political, and you spout off in a negative, cynical way about politics or the leadership of your country, you'll likely put off some of your fans who may respond as if you are attacking them personally. The same is true about religion. If your faith in God defines you and your music, then by all means be that person of faith. Don't hold back. But if your music isn't defined by your faith, just know that if you start praising the Lord in your posts you might put off some of your fans. Politics and religion are potentially divisive topics, as are abortion, gay-rights, immigration and even extreme environmentalism. Being controversial can be good for publicity, but when you're trying to develop relationships with your fans, going on and on about your political, social or religious views can be the very thing that turns them against you. Be very careful not to use your status update as your own personal soapbox to preach from, unless you feel so strongly about those things that you don't care if you lose fans and sales over it. It may be that you don't care if you lose fans over expressing your opinions, and if you don't, then go for it. Be who you want to be. Your strong opinions will likely appeal to a few like-minded thinkers. Just be aware of what you post, how it might come across, and whether you're OK with how it effects others' perceptions of you. The question I always ask myself before posting something potentially controversial is; "does what I'm about to write define me as an artist and a person? or am I just venting?" My politics, for example, has nothing to do with my music. So I keep my thoughts on politics to myself, generally speaking. I am not defined by my politics. I am defined by my faith in God, however, so I, personally, have no problem praising the Lord in my status updates. I just do it tastefully. Not every post I write says "Hallelujah," but I'm also not afraid to thank God publicly for a beautiful day. It's all about balance, and being watchful of your public persona. SUGGESTION: When it comes to politics, especially, I understand how hard it can be to restrain yourself from venting your political frustrations in your status update. If you find you simply can't restrain yourself, let me suggest you create another outlet specifically for your political rants. Perhaps a Twitter account specifically set up to let you express your political views, one that doesn't have your name on it. Then you can have the satisfaction of expressing your opinions to the world at large without destroying your relationships with fans of your music that have an opposing viewpoint. 3) Stay Positive. Don't Worry. Be Happy. Listen, no one likes a complainer. Don't use your status update to tell the world how lousy you feel, how stressed out you are, how hard life is, how unfair you've been treated, how misunderstood you are or how much you hate your job. People tire of whiners quickly. Do you enjoy listening to people complain? Neither does anyone else. Complaining is the fastest way to lose friends and followers (in real life too). Whatever you do, when you post a status update, be positive and encouraging to others. Present your life as good, blessed and happy, even if it isn't at every single moment. If you are a joyful person, people will be drawn to you. When you post, do so with a smile, and you'll make your reader smile. Smiling is good. 4) Be Interesting. Be Inspiring. If you're going to update your status to tell the world what you're up to, find ways to make your posts exciting to read, even if it's just the way you phrase something. Don't post an update that says… "checking e-mail" or "watching tv" or "just chillin'" Blah. Who cares? Be creative. Be imaginative. Be specific. Make every post count and mean something. If the post you're about to write isn't something you'd care about if someone else wrote it, then why bother writing it yourself? Make sure that, from your readers' perspective, you lead a very interesting life. If you don't feel like your life is very interesting, then do something about it. Don't just sit there staring at the TV. Make your life interesting. It's in your power to do so. Then talk about it in happy, positive ways. Make your life sound like the "dream life." Your fans don't expect you to be dull. Life is too short to be dull. Don't be dull! 5) Watch Your Back. Guess what? Not everyone who follows you is a "fan." Did you know that people might follow you who don't care about you or your music? It's true! It's easy to forget this sometimes. You just happily post away assuming everyone loves you and thinks you're terrific. But you never know who's following you, and not everyone who follows you is friendly toward you. People who are curious about how you do business might follow you. You ex-girlfriend with a grudge, stalker boyfriend or an overzealous fan might follow you. People looking for ways to tear you down might follow you. People who want to test your integrity might follow you. People who are looking for good ideas might follow you. People who want to copy what you're doing might follow you. Always be aware that people might be following you who don't have your best interests in mind. So don't be giving away all those family/trade/business secrets and don't be too revealing about yourself. Don't give your enemies ammunition to use against you. 6) Keep Your Private Moments Private. Doing something cool and fun with your family? Use social media to tell people about it after the fact, not before. Don't post a status update saying… "Taking my kids bowling at Lois Lanes in a few minutes. Should be fun!" That will just invite curious fans to come down and join you. Might be OK. Might be weird. Instead, wait until you've finished your fun family outing and then post a message about the great fun you had earlier in the evening. There are, of course, times when you want your fans and followers to meet up with you somewhere; when you're playing a show, or just a special meet and greet with fans, for example. But keep your private moments private. 7) Don't Ignore Your Fans. Respond With Enthusiasm. When you start posting frequently, fans and others will respond with comments of their own. Respond back, acknowledge them and be positive, enthusiastic and encouraging. If folks respond to your comments and you repeatedly ignore them, some are bound to take it personally. Always engage your fans. If they comment on a song or an album of yours, thank them and let them know you appreciate it. Tell your fan their comment made your day and in doing so you'll make their day. Just think - every day you can chat with dozens of total strangers, encouraging them to share your music with their friends and family. Do you realize the power of this? If a hundred people are following you, that's a hundred people you can ask, via your status update, to spread the word about your music. With social networking, you always have a crowd at your fingertips. Work the crowd. Social media is a great thing, and a fantastic way to stay in touch with your fans on a day to day basis. But words are powerful, lasting, and shape people's perceptions of who you are. So always be watchful of how you present yourself in writing. Think twice before you post, stay positive, be enthusiastic and avoid being negative or boring. David Nevue is the founder of The Music Biz Academy and Whisperings: Solo Piano Radio. 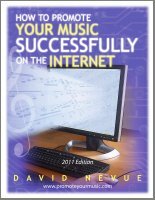 He is also a professional pianist, recording artist, full-time Internet musician, and author of the book, "How to Promote Your Music Successfully on the Internet."